Public Square just as demolition was beginning. A major component of the Public Square project is streamlining the location of and access to utilities, both publicly and privately owned, into a new duct system. When all is said and done, a new duct will run through the square with common points of access for different utility companies. This will be much more efficient than the status quo, made hectic by the addition of telephone lines and telecommunications wires from out of state companies under the square over the past decades. To prepare for the rerouting of power lines into the new duct and to prevent deconstruction and demolition work from hitting live wires, Cleveland Public Power spent last weekend de-energizing power within portions of Public Square. In the process a section of streetlights in Downtown went dark which was reported on local news channels. 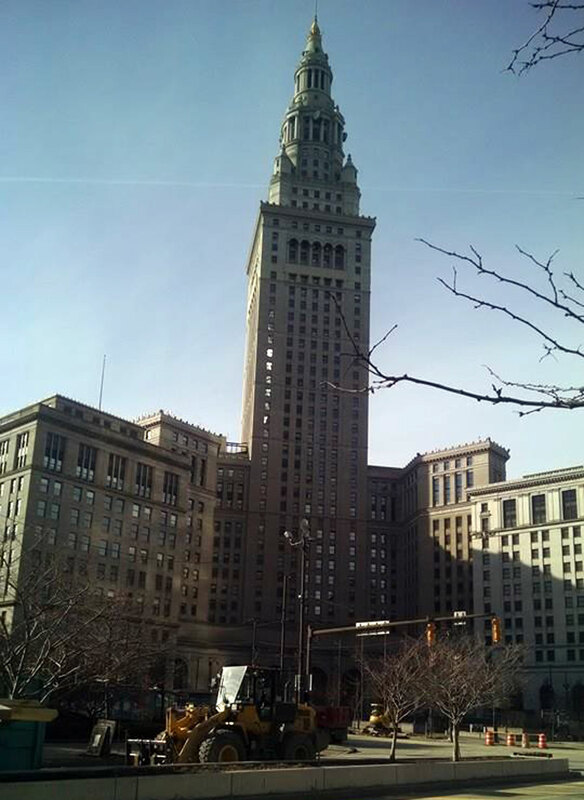 As of this morning, the vast majority of street lighting Downtown has been restored and Cleveland Public Power is working to have all power restored to streetlights by tomorrow. Power to decorative lighting poles outside of the main entrance to Terminal Tower is fed from the center of the square and not from the line that serves streetlights – for this reason these light poles are currently without power – to prevent the entrance to Terminal Tower from appearing dark, Cleveland Public Power has installed temporary lighting that illuminates the building entrance and the area surrounding it so that this area isn’t left in the dark. The safety of our residents and businesses is a priority and we will work to ensure that outages like this do not occur again as this project continues. We are pleased to be a part of Cleveland’s current renaissance and we look forward to lighting the new public space that will add to the life and vitality of Downtown Cleveland.